Cambridge Chorale is a dynamic vocal ensemble committed to performing music at the highest level. Formed in 1994 by Michael Kibblewhite and under the direction of Julian Wilkins between 2005 and 2016, the choir established itself as one of the most accomplished adult choirs in the country. 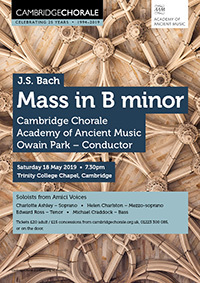 Now directed by Owain Park, the choir continues to perform a wide range of repertoire, from choral classics such as Bach’s Mass in B Minor, Handel’s Messiah and Brahms’ Requiem, to lesser known masterpieces by the likes of Frank Martin and Alexander Grechaninov. The choir is equally at home performing challenging contemporary works by composers such as Tarik O’Regan, Eric Whitacre and Ola Gjeilo. In celebration of the choir’s 20th anniversary in 2014, works by young Cambridge composers Alex Woolf and Ed Zanders were commissioned and given their world premieres. The choir has produced a number of critically acclaimed recordings, including Songs and Sonnets (December 2014), Salvator Mundi (March 2011), A Christmas Celebration (2007), and My Spirit Sang All Day (2005). 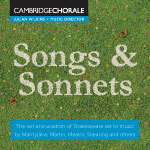 The recordings demonstrate both the high quality and the versatility in performance that have become the hallmarks of Cambridge Chorale. The choir is a highly sought after partner for musical collaborations across the UK. It has made numerous recordings for BBC radio and is a regular feature at the Brandenburg Choral Festival in London. Other notable achievements include winning the Audience Prize and Gold Medals in every entered category at the Riva Del Garda International Choral Competition (2002). More recently, the choir was recognised as one of the UK’s top six adult choirs in the finals of the BBC Radio 3 Choir of the Year competition (2008). The members of the choir come from all walks of life - teachers, scientists, stay-at-home mums, software developers, PhD students and more - and are united by a love of choral music-making. Being an amateur choir, the only income is through ticket sales, donations, and subscriptions from the singers themselves. If you enjoy Cambridge Chorale’s performances, you might consider supporting the choir by becoming a Friend or Patron; donations go towards music purchase, to expand the choir’s repertoire in the world of choral music.